Last month, we were thrilled to announce that Projects Abroad and Animal Defenders International(ADI) have joined forces to rehome rescued circus animals. In an exciting update, the first group of these animals have arrived at their new home in the heart of the Amazon Rainforest. ADI has been working in Peru as part of their ‘Operation Spirit of Freedom’ campaign,rescuing mistreated animals from neglectful and abusive treatment in Peruvian circuses. Their operation has been a huge collaboration with CITES and thePeruvian governmentand military; they have successfully confiscated over 100 individuals in this campaign alone. Our new partnership with ADI has seen eight animals rehomed at Taricaya Ecological Reserve, where Projects Abroad has been operating since 2001. 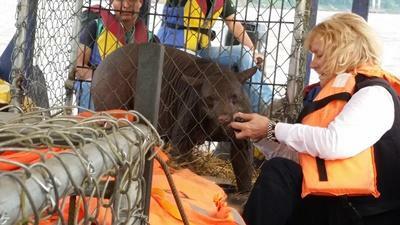 Two of these animals have captured the hearts of the international community due to their tragic stories. The first is Cholita, an elderly spectacled bear whose abuse was abhorrent; the circus owners chopped off her front toes to remove her claws and pulled her teeth out to stop her biting. Spectacled bearsare the last remaining short-faced bear species on the planet and South America’s only bear. Their natural habitat is dense jungle and they are elusive and hard to find. Deforestation and hunting have significantly reduced their numbers. Cholita had spent over 20 years in a tiny cage being poked by curious circus-goers and being fed too little. An adult spectacled bear can reach 150kg, but Cholita weighs less than 50kg. The second case of note is that of Mufasa, a male mountain lion. Mountain lions, also known as cougars or pumas, have a huge range and can be found from Canada all the way to Argentina. There are thought to be several subspecies of this cat and they can survive high in the mountains or deep in the jungle. Mufasa, as this male is called, is another elderly rescue from a circus and whilst he has all his claws and teeth, serious malnourishment means that he is relatively small for such an effective predator. His stunted growth is irreparable but with the proper diet and exercise provided at Taricaya, we are optimistic that he will gain weight. 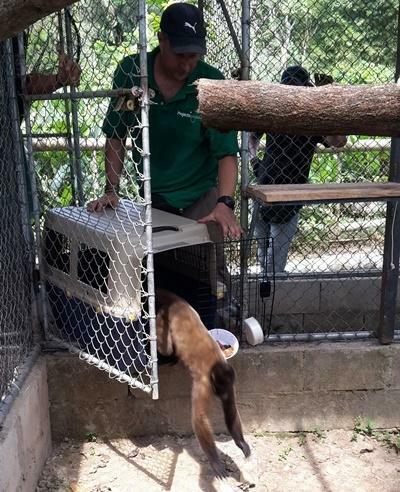 Brown woolly monkeysRojas, Joan and Diego, Peruvian spider monkeys Pepe-Lucho and Lily, and James the military macaw have also joined Cholita and Mufasa at their new home. The animals have all come from similar backgrounds of abuse and mistreatment. Once their quarantine period of 60 days is over, the primates will be united with our resident troops of the same species and the macaw will join our other two macaws to freely move around the centre as they regrow their flight feathers and strengthen their muscles. 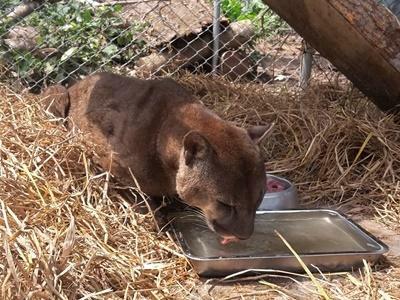 Providing adequate enclosures for Cholita and Mufasa proved to be a challenging task. There was a huge amount of preparation and manual labour required. 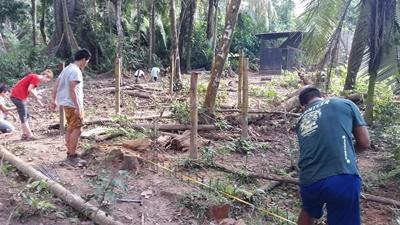 Together with a team from ADI, our staff andvolunteers quickly began clearing the areas and preparing materials. Due to limited time and a pressing need to relocate the animals, working days were lengthened, physical reserves exhausted and everybody involved was pushed to work harder than ever. 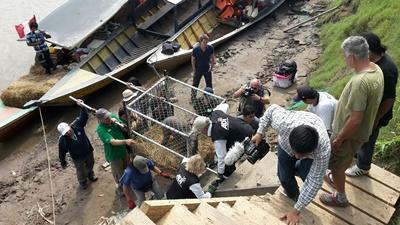 With much dedication, the two enclosures were completedin less than four weeks. Mufasa’s enclosure is 360m2, complete with a roof, whilst Cholita’s enclosure is an impressive 600m2 and has a bathing pool and cave for her to enjoy. The ADI team began their journey to transfer the animals on 2ndSeptember, preparing the vehicles and cages to be as comfortable as possible for the animals during the 1,600 km journey across the Andes.After much anticipation and a long, tiring journey to Taricaya, the rescued animals finally arrivedat their new home on 5th September. 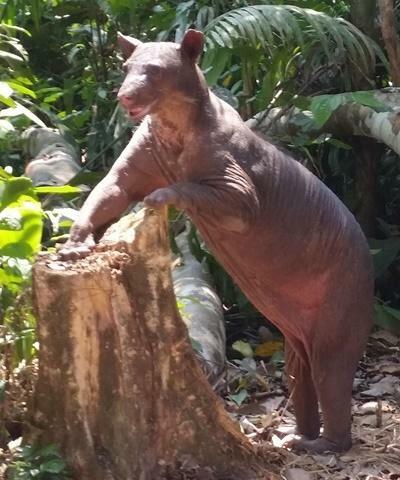 The animals have settled in very wellduring their first week at Taricaya and are thoroughly enjoying their new home in the jungle, which provides a very similar habitat to their natural one. They are slowly adjusting to having large spaces and natural stimuli, which they hadn’t experienced during their many years spent in captivity. Projects Abroad staff and volunteers will continue to monitor and care for them and ensure that they adaptwell to their new environment. With the success of this first project, we are now expecting to rehome a further three bears later this year, with two set to arrive at the end of the month. We are hopeful that these bears can become companions for Cholita, who has lived in isolation her entire life. ADI is urgently appealing for donations to fund the bears’ new homesat Taricaya. Send your support today.